Daktronics of Brookings, South Dakota, has partnered with Kent State University to provide new centre-hung LED video boards and a ribbon board to the Memorial Athletic and Convocation Center in Kent, Ohio. The installation was completed this fall to bring an improved experience to Golden Flashes fans this season. The centre-hung features four LED video boards. Two sideline-facing screens each measure 10.5 ft high by 19 ft wide while the end-facing screens measure 9.5 ft high by 16.5 ft wide. All four screens feature 6mm line spacing to provide crisp, clear imagery with wide angle visibility to appeal to every seat in the arena. Along the seating fascia, a new ribbon board was installed. It measures 2.5 ft high by 70.5 ft long and features 10mm line spacing. This allows for supplemental information to the main displays and provides the opportunity to highlight sponsors throughout events while immersing fans in the game-day action. 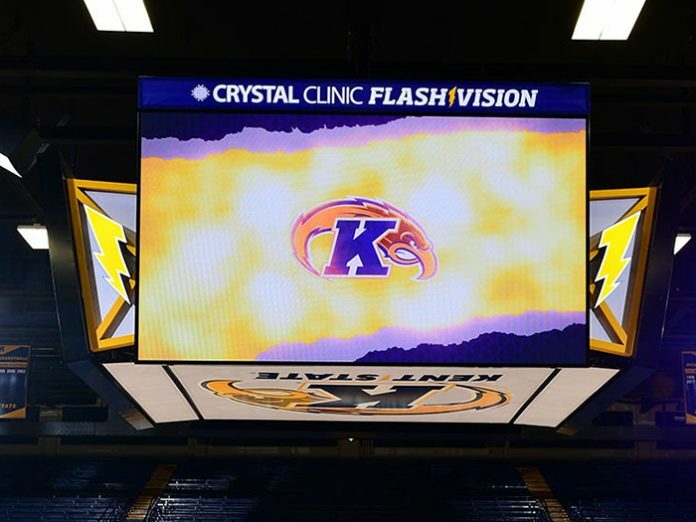 The centre-hung video boards are capable of showing live and recorded video, game-day statistics, graphics and animations, and sponsorship messages. Each display can be divided into zones to show any combination of content listed above. The project includes a fixed-digit basketball scoreboard to share all of the expected statistics for the sport, including score, game time, quarter, timeouts remaining and possession arrows. A custom audio control system was included with the installation to add to the functionality of the entire audiovisual system.